Jordan De Goey will remain a Pie until the end of 2020. COLLINGWOOD'S Jordan De Goey has put pen to paper on a new two-year deal with the Magpies. The out of contract 22-year-old will remain at the Pies until the end of 2020. It was revealed on Wednesday that the Kangaroos had a five-year, $1 million per year deal on the table for the midfielder, who is out of contract at the end of the season. But the promising midfielder has turned down big money offers by inking a new contract with the Pies - having played 61 games since being drafted with Pick No. 5 back in 2014. The midfielder says he wants to be part of Magpies' journey to September success, with the Pies having won their last six matches in 2018. 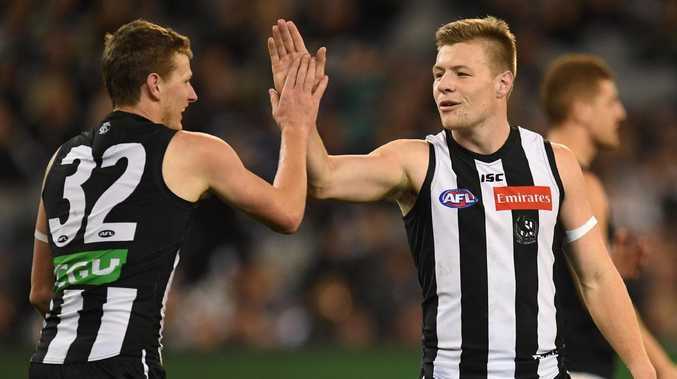 "I am grateful for the opportunity to remain at Collingwood and grateful to the people who have helped me find my way," De Goey told the club's website. "I'm happy to have a club and some fantastic people around me that I can rely on, trust and enjoy life with. And there is clearly something building at Collingwood that I want to share in. Jordan De Goey kicks the ball. "The interest from elsewhere was flattering and I hope I dealt with those enquiries respectfully. "I'll now continue to push to improve, to get the best out of myself and those around me." The Magpies easily accounted for the Gold Coast Suns on Saturday night, moving to second on the ladder, with De Goey booting two goals from 14 disposals. Collingwood List Manager, Ned Guy, told the club's website that De Goey is entering his prime as an AFL footballer. "Jordy wants to be as good as he can possibly be. He said a number of times in the discussions we had over his new contract that he wants to keep improving and making the right calls, to take on more responsibility," Guy said. "It's obviously pleasing and rewarding for a lot of people at Collingwood who have invested a great deal in Jordy that he wants to realise his ambitions at Collingwood, which he sees as his football home."